RED DEER - Applications are now being accepted from experienced and interested individuals to serve in a leadership capacity with Hockey Alberta’s Officials Committee for the 2018-19 season. Available positions include the Officials Committee Chair, as well as the Regional Coordinator (previously Zone Chair) positions for each of the six Officials Regions in the province: Peace, North, North East, North Central, Central and South. In addition, applications also are being accepted for the following Coordinator positions: Data, Match Penalty, Supervision, Male Development and Female Development. The Officials Committee provides oversight and monitoring of the delivery of the Hockey Canada Officiating Program within Hockey Alberta. The Committee is responsible for the administration, operational standards and development of new components regarding the officiating program in Alberta. Responsibilities include: recruiting, training, mentoring, developing and evaluating officials; selecting and appointing officials for all provincial, regional and national championship games/events hosted in Alberta; and providing guidance and leadership on all matters pertaining to officiating with leagues, minor hockey associations and other stakeholders. Deadline for applications for the Committee Chair is May 1. Deadline for applications for the Coordinator positions is May 8. Please note that Hockey Alberta’s application platform requires that once you start an application you must complete and submit in the same sitting. RED DEER - The third and final week of the Hockey Alberta Provincial Championships, presented by ATB Financial, kicks off on Thursday across the province with the final six tournaments of 2018. Provincial championships set for March 29 - April 1 include: Junior B (Fort St. John), Junior C (Sherwood Park), Midget AA (Spruce Grove), Midget Female Elite (Calgary), Bantam AA (Edmonton), Peewee AA (Glenlake/Calgary). You can keep track of all this weekend’s tournaments at haprovincials.ca, by following along with the score ticker at hockeyalberta.ca, on Facebook, or on Twitter (using the hashtags #HAProvincials or #ATBProvincials), or on Snapchat (username: hockeyalberta). The Junior A Provincial Championship will be decided through the Alberta Junior Hockey League Playoffs. The North and South Division finals begin on March 31. 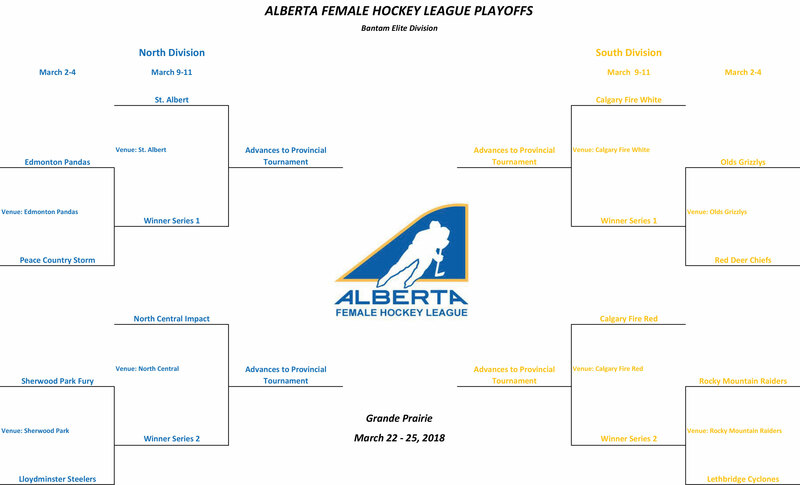 The Brooks Bandits and Okotoks Oilers are set to face off in the South Division Final, while the Whitecourt Wolverines and Spruce Grove Saints will battle in the North Division Final. RED DEER - Hockey Alberta is pleased to announce the rosters for the 2018 Alberta Cup. Eight teams will take to the ice at the Agrena in Spruce Grove April 25-29. The teams include two from each of Calgary and Edmonton, and one each representing the South, Central, Northeast and Northwest zones of the province. Twenty 2003-born players comprise each roster, along with volunteers serving as head coach, assistant coaches, trainer, and director of operations. Rosters were selected in the aftermath of zone camps held March 23-25 throughout the province. "We are very excited to take the next step in the Road to Red Deer," said Manager of Team Alberta, Mike Kraichy. "We’re looking forward to a fantastic event in Spruce Grove this year, and for the high level of talent that will hit the ice." The teams will play in a four-day, tournament-format competition. The event also features an education seminar hosted by the Western Hockey League. Eighty players from this year’s competition will be selected to attend Team Alberta’s Provincial Camp in July, with a chance to represent their province at the 2019 Canada Winter Games in Red Deer. Tournament passes for the 2018 Alberta Cup are now on sale. A weekend pass is $59 (plus GST), a family weekend pass (two adults and two children) is $173 (plus GST), and a day pass is $17 (plus GST). Day Passes will also be available at the door. Tickets for the 2018 Alberta Cup Banquet are also now available for purchase. Tickets are $59 per person (plus GST). Only 180 tickets are available, and are sold on a first-come, first-served basis.. The Alberta Cup Banquet is Saturday, April 28 at 5 p.m. at the Stony Plain Pavilion. The 2018 Alberta Cup is looking for passionate, dedicated volunteers! If you are interested in being part of the Alberta Cup, numerous volunteer positions are available throughout the tournament, including: off-ice officials, admission table, program and 50/50 sales, security and more. To apply to be a volunteer, please fill out the form below. 2018 Alberta Cup apparel is now available for pre-order. All orders must be placed by April 12. To place an order, click the link below. RED DEER - Week Two of the Hockey Alberta Provincial Championships, presented by ATB Financial, wrapped up on Sunday with 18 teams crowned as 2018 Provincial champions. Fifteen tournaments ran across the province from March 21-25, while three league champions also earned provincial honours last week. Teams skating away from this weekend’s tournaments with gold medals were: Bonnyville Sr. Pontiacs (Senior AA), Lethbridge Headwater Hurricanes (Minor Midget AAA), Lethbridge Hurricanes (Midget A), High Prairie Legionnaires (Midget B), Stettler Storm (Midget C), Kitscoty Pitbulls (Midget D), St. Albert Slash (Midget Female AAA), SPS Fuzion (Midget Female A ), Irma Aces (Midget Female B), Calgary Fire White (Bantam Female Elite), Cold Lake Ice (Peewee A), Provost Blades (Peewee B), Winfield Peewee (Peewee C), Irvine Bulldogs (Peewee D), and Okotoks Oilers (Peewee Female A). Two league playoffs wrapped up on Wednesday evening in Senior AAA and Bantam AAA. The Lacombe Generals repeated as Senior AAA Provincial champs with a 6-1 win over the Stony Plain Eagles, taking the best-of-seven series four games to one.The Generals now head to the Allan Cup, which runs April 9-14 in Rosetown, SK. An incredibly close Bantam AAA series between the Airdrie Xtreme and St. Albert Sabres, which saw a total of nine overtime periods, came to a close when Airdrie scored near the end of the fourth overtime of game five. The Xtreme advance to the Western Canadian Bantam AAA Championship, March 29 - April 1 in Kamloops, BC. The Alberta Junior Female Hockey League crowned a champion as well, with the Sherwood Park Steele skating away with the Provincial banner. In addition to the on-ice action, five more host communities held a True Spirit of Hockey Day to celebrate a shared love for hockey and the community that supports the sport: Daysland/Forestburg (Thunderstars), La Crete, Okotoks, Oyen, and Taber. The 2018 Provincial Championships tournament schedule wraps up this coming weekend with six tournaments set for March 29 - April 1: Junior B (Fort St. John), Junior C (Sherwood Park), Midget AA (Spruce Grove), Midget Female Elite (Calgary), Bantam AA (Edmonton), Peewee AA (Glenlake/Calgary). The Midget AAA Provincials will wrap up by April 1 as well, with the best-of-five series between the Knights of Columbus Pats and Lethbridge Hurricanes tied at 1-1. The Junior A Provincial Championship will be decided through the Alberta Junior Hockey League Playoffs. The North and South Division finals begin on March 31. The Brooks Bandits and Okotoks Oilers are set to face off in the South Division Final for the second straight year, while the Spruce Grove Saints will have to wait for Game Seven between the Whitecourt Wolverines and Fort McMurray Oil Barons to decide who they will face in the North Division Final. FORT SMITH/HAY RIVER - Team Alberta North is skating away from the 2018 Arctic Winter Games with a pair of medals. Despite trailing for most of the game, the Bantam Males looked poised for overtime in the gold medal game against host Northwest Territories, before allowing a buzzer-beater with less than 10 seconds to go in the game. Jacobi Rouleau and Joseph Gerwatoski (2) scored for Alberta North, who claimed the silver medal after winning gold at the 2016 Arctic Winter Games. Earlier in the day, Alaska edged Nunavut 3-2 to win the bronze medal. Meanwhile, the Junior Females went the distance against the Yukon, and took home the bronze medal after a 3-2 shootout win. Tea Vasseur and Sanna Mierzewski scored for Alberta North, with Sanne Hansen scoring the shootout-winner. In the championship game, Alaska edged host Northwest Territories 3-2 to claim the Junior Female gold medal. FORT SMITH/HAY RIVER - Both Team Alberta North squads have a chance to medal at the 2018 Arctic Winter Games, with the Bantam Males set to play for gold, and the Junior Females looking to capture bronze. The Bantam Males opened up Thursday with a 3-3 tie against Nunavut to close out round-robin play, finishing fourth in the standings. Alberta North got goals from Jacobi Rouleau, Brandon MacIntyre and Hudson Chalifoux. Later on in the day, the Bantam Males avenged a 7-2 loss on Monday against Alaska by upsetting the top-seeded team 2-1, earning a berth in the gold medal final, and a chance to repeat as Arctic Winter Games champions. Sheldon Parliament and Brandon MacIntyre were the goal-scorers for Alberta North. The gold medal game is set for 4 p.m. on Friday against the host Northwest Territories, after Nunavut and Alaska battle for bronze. Meanwhile, in the Junior Female’s semi-final matchup, Alberta North narrowly missed out on the championship final with a 3-2 loss to Northwest Territories. Sanne Hansen and Abigail-Marie Robinson scored for Alberta. The Junior Females will go for bronze against the Yukon at 4:00 p.m. on Friday, while Alaska and host NWT will battle for gold at 6:00 p.m.
FORT SMITH/HAY RIVER - The Team Alberta North Junior Female squad punched its ticket to the semi-finals, while the Bantam Males moved to a 1-2 record on Wednesday at the Arctic Winter Games. A tough second period led to a 5-2 loss for the Bantam Males again the host Northwest Territories. After NWT opened the scoring, Ethan Alook-Ferguson answered for Alberta North, before allowing three unanswered goals in the second. Cooper Coates responed for Alberta in the third, before NWT put it away just minutes later. The loss moves Alberta to 1-2 in round-robin play, but its two points are enough for a semi-final berth on Thursday afternoon. The Bantam Male team closes out round-robin play on Thursday morning at 9:00 a.m. against Nunavut. Meanwhile, the Junior Females drew to a 3-3 tie with the Yukon on Wednesday evening to wrap up round-robin play, which was enough to seal a spot in the semi-finals. Myah Cassault, Sanne Hansen and Tea Vasseur were the goal-scorers for Alberta North. The Junior Females will battle the host Northwest Territories Thursday at 5:00 p.m. for a spot in Friday’s gold medal game. RED DEER - Fifteen new champions will be crowned this weekend, as Week Two of the 2018 Hockey Alberta Provincial Championships, presented by ATB Financial, gets underway across the province. Provincial championships set for March 22-25 include: Senior AA (Bonnyville), Minor Midget AAA (Lethbridge), Midget A (Sherwood Park), Midget B (Wetaskiwin), Midget C (Rimbey), Midget D (Taber), Midget Female AAA (Red Deer), Midget Female A (Strathcona), Midget Female B (Lac La Biche), Bantam Female Elite (Grande Prairie), Peewee A (Edmonton), Peewee B (La Crete), Peewee C (Thunderstars), Peewee D (Oyen), and Peewee Female A (Okotoks). The Minor Midget AAA Provincials get underway on Wednesday afternoon, while the remaining 14 tournaments begin on Thursday evening. Five more host communities will host a True Spirit of Hockey Day this week: Daysland/Forestburg (Thunderstars), La Crete, Okotoks, Oyen, and Taber. You can keep track of all this weekend’s tournaments at haprovincials.ca, by following along with the score ticker at hockeyalberta.ca, on Facebook, Twitter (using the hashtags #HAProvincials or #ATBProvincials), or on Snapchat (username: hockeyalberta). RED DEER/CALGARY - Alberta was very well-represented when the Western Hockey League announced its 2017-18 Eastern and Western Conference award winners and All-Star teams on Wednesday. FORT SMITH/HAY RIVER - It was another up and down day for the Team Alberta North Male and Female squads at the Arctic Winter Games. The Junior Females, playing their third game in just over 24 hours, skated to a 4-1 loss against the Northwest Territories. NWT carried a 3-0 lead halfway through the third until Sanne Hansen put Alberta North on the board, but NWT responded to make it a 4-1 final. The Junior Female team now holds a 1-2 record moving into its final round-robin game on Wednesday at 5:00 p.m.against the Yukon. After a 7-2 loss on Monday, the Bantam Males rebounded in a big way on Tuesday with an 8-0 win over the Yukon to move to 1-1 at the Arctic Winter Games. Joseph Gerwatoski, Ethan Alook-Ferguson, and Dalton Seniantha all had two-goal games for Alberta North, with Sheldon Parliament and Jacobi Rouleau adding tallies as well. The males are back in action Wednesday at 2:00 p.m. against the Northwest Territories. FORT SMITH/HAY RIVER - It was an up and down first day for Team Alberta North at the 2018 Arctic Winter Games in Fort Smith and Hay River, NWT. The Bantam Male squad dropped a 7-2 decision to Team Alaska on Monday in its only game of the day. Alberta and Alaska were tied 1-1 after the first period, with Alaska opening the scoring, and Joseph Gerwatoski replying for Alberta minutes later. Alaska came back with four straight goals in the second period, and two more in the third before Adam Morrow stopped the bleeding for Alberta. The Bantam Males are back at it Tuesday afternoon at 2:00 p.m. against the Yukon. Meanwhile, the Junior Female team kicked off the Arctic Games with a bang, shutting out Nunavut 7-0 in its first game of the day. Alberta North came out of the gate firing on all cylindars, with five goals in the first period from Kennedy Hartman, Shelby-Lyn Richards (2), Rhys Johnson and Kali Laderoute. Sanne Hansen and Hartman scored in the second to make it a 7-0 game. After a short turnaround between games, the Junior Females were edged by Alaska 1-0 to move to 1-1 in the tournament. The game was deadlocked until Alaska broke the goose egg halfway through the third, and managed to shut out Alberta North the rest of the way. The Female squad’s next game is Tuesday afternoon against the host Northwest Territories. RED DEER - Fourteen new provincial champions were crowned on Sunday, highlighting a busy first weekend of the 2018 Hockey Alberta Provincial Championships, presented by ATB Financial. Six Bantam Teams, one Peewee team, and seven Atom teams skated away from their respective tournaments with gold medals: Springbank Rockies (Bantam A), Athabasca Hawks (Bantam B), Westlock Warriors (Bantam C), Valleyview Icebears (Bantam D), Okotoks Oilers (Bantam Female A), Lloydminster Blazers (Bantam Female B), Olds Grizzlys (Peewee Female B), Whitemud Warriors (Atom AA Major), Canmore Eagles (Atom AA Minor), Drayton Valley DV Meter All Stars (Atom A), Didsbury Ramblers (Atom B), Drumheller Dragons (Atom C), Bentley Canucks (Atom D), and Vermilion Selte Fuels Tigers (Atom Female). In addition to the on-ice action, seven host communities held a True Spirit of Hockey Day to celebrate a shared love for hockey and the community that supports the sport: Beaverlodge, Bentley, Chestermere, Elk Point, Rocky Mountain House, Stettler and Whitecourt. It was a busy weekend for post-secondary teams as well, as the MacEwan Griffins Men’s team repeated as ACAC Champions, one week after the Griffins’ Female team captured the ACAC title on the women’s side. Meanwhile, the University of Alberta Golden Bears continued their winning ways, repeating as the U-Sports National Men’s Hockey champions. FORT SMITH/HAY RIVER - The quest for gold begins on Monday for Team Alberta North Bantam Male and Junior Female, as the 2018 Arctic Winter Games get underway in Fort Smith and Hay River, Northwest Territories. The Bantam Male squad’s tournament kicks off at 11 a.m. on Monday against Alaska in Hay River, while the Junior Females battle Nunavut at 11:30 a.m. in Fort Smith. The Bantam Males will play four round-robin games, with the semi-finals set for Thursday afternoon, and the medal rounds on Friday. On the Junior Female side, there will be three round-robin games, with the semi-finals to go on Thursday and the finals on Friday. You can follow along with Team Alberta North Male and Female on hockeyalberta.ca, the Arctic Winter Games website, or by following Team Alberta on Twitter. RED DEER – The 2018 Hockey Alberta Provincial Championships, presented by ATB Financial, officially kick off today (Thursday) with 14 tournaments across the province. Provincial championships set for March 15-18 include: Bantam A (Marwayne), Bantam B (Rocky Mountain House), Bantam C (Drumheller), Bantam D (Elk Point), Bantam Female A (Brooks), Bantam Female B (Stettler), Peewee Female B (Medicine Hat), Atom AA Major (Glenlake/Calgary), Atom AA Minor (Chestermere), Atom A (Whitecourt), Atom B (Beaverlodge), Atom C (Spirit River), Atom D (Bentley), and Atom Female (St. Paul). Seven host communities are also celebrating True Spirit of Hockey Day this week, with Beaverlodge, Bentley, Chestermere, Elk Point, Rocky Mountain House, Stettler and Whitecourt all hosting a number of fun activities at local schools, allowing students to learn about hockey, and the teamwork and friendships that can be generated in the sport. RED DEER – Four outstanding individuals, along with a pair of gold medal-winning Team Alberta squads comprise the 2018 Induction Class for the Alberta Hockey Hall of Fame (AHHF). We invite you to celebrate the legacy of these Alberta hockey legends on Sunday, July 22 at the Coast Hotel in Canmore. For ticket information, click here. RED DEER – Six months of regular season and tournament action, including up to six weeks of games in Zone playdowns, culminates this month, as teams prepare to “March to a title” at the 2018 Hockey Alberta Provincial Championships, presented by ATB Financial. Tournament action will determine the majority of the 2018 provincial champions. Fourteen titles will be awarded on March 18. March 25 will see another 15 champions crowned, and the remaining six champions will be determined on April 1. Tournament champions will emerge from a weekend of round-robin pool play and playoff action in their respective tournaments. The slate of provincial championship tournaments starts next weekend, March 15-18 in 14 locations around Alberta. Provincial championships set for March 21/22-25 include: Senior AA (Bonnyville), Minor Midget AAA (Lethbridge), Midget A (Sherwood Park), Midget B (Wetaskiwin), Midget C (Rimbey), Midget D (Taber), Midget Female AAA (Red Deer), Midget Female A (Strathcona), Midget Female B (Lac La Biche), Bantam Female Elite (Grande Prairie), Peewee A (Edmonton), Peewee B (La Crete), Peewee C (Thunderstars), Peewee D (Oyen), and Peewee Female A (Okotoks). Four champions will be determined via league playoffs: Senior AAA, Junior A, Midget AAA, and Bantam AAA. The final round of the Senior AAA provincials kicks off tonight (Friday) between the Lacombe Generals and the Stony Plain Eagles. Playoffs are just underway in the Alberta Junior Hockey League, while the Midget AAA Division Finals begin on Sunday. The Bantam AAA Provincial Championship is now set, with the St. Albert Sabres and Airdrie Xtreme squaring off, beginning on Saturday. For schedules, arenas, host organizations, and other event-specific information, check the Provincial Championships website at haprovincials.ca or the Hockey Alberta website at hockeyalberta.ca. You can also follow Hockey Alberta on Twitter and Facebook. In addition to the on-ice action, several communities will participate in True Spirit of Hockey Day activities in their location communities. In conjunction with the Provincial Championship tournament hosts in these communities, a local school is hosting a number of fun activities, allowing students to learn about hockey, and the teamwork and friendships that can be generated in the sport. Participating communities are: Beaverlodge, Bentley, Chestermere, Daysland/Forestburg, Elk Point, La Crete, Okotoks, Oyen, Rocky Mountain House, Stettler, Taber and Whitecourt. RED DEER - Male and female athletes across the province can now register for Hockey Alberta’s 2018 Small Area Games camps. Hockey Alberta is offering seven Small Area Games camps in March, April and May in Calgary (two), Grande Prairie, Lethbridge, Lloydminster, Medicine Hat and Red Deer. Hockey Alberta’s Small Area Games Camp is a multi-week program, usually running for four or five weeks, with one or two sessions scheduled each week. The focus of the camp is to utilize 3-on-3, cross-ice games at both ends of the rink to teach individual and team tactics, in a fun and competitive environment. RED DEER - Hockey Alberta’s Coach of the Month for February is Charles Vance of Calgary. Charles is currently the Head Coach of the Calgary Saints Peewee 4 team. "This year, I have a great group of kids, parents and coaching staff," said Charles. "We were lucky enough to win a contest to represent Alberta in the Canada 150 Tournament in Ottawa. It was amazing to go through the process of creating the video and hearing what the players love about their country, and hockey. Being a coach is such a rewarding part of my life. I get to see players grow as athletes and in their personal life. I am humbled when players from previous years make it a point to come and tell me what has been going on with them both with hockey and life in general. I try to impact each and every player in a positive way and keep their passion for the game of hockey alive." "This gentleman is what all coaches should aspire to be like, he is making a good impact on so many kids in our association," said the person who nominated Charles. "He walks around the Don Hartman Arena like a celebrity, because every kid that walks by has to go over and say ’hello, Coach’. If you spend any time around him you will be soon be sucked in and helping out with a team or a player that needs some extra help, because Charlie has this way of inspiring coaches and players to go out and help other teams. He gets the players engaged and makes deals with players that he will die his hair if they “try their best for the rest of the year”. This year he heard about an Atom goalie that was having a hard year and decided to set up some Junior goalie coaches and himself to go out and help her out. He even went as far as making a deal with her that he will do push-ups for every save she makes in a game. He is truly inspiring these kids to be better people be leading by example and being a better person. Thank you Charlie, please know you have made a difference!"